Teigan contacted Dee’s Curtains and Blinds following her wonderful news that she was expecting a new edition to the family and I was pleased to help as I so enjoyed the first room we dressed together. Happy New Year, hope this message finds you well. You did such a fabulous job of our crush velvet bedroom curtains I’d like to use you again but this time a baby’s room! We are due in May so I am in the very early stages of getting the room prepared. I have collected some ideas that I like. Similar spec to before i.e. 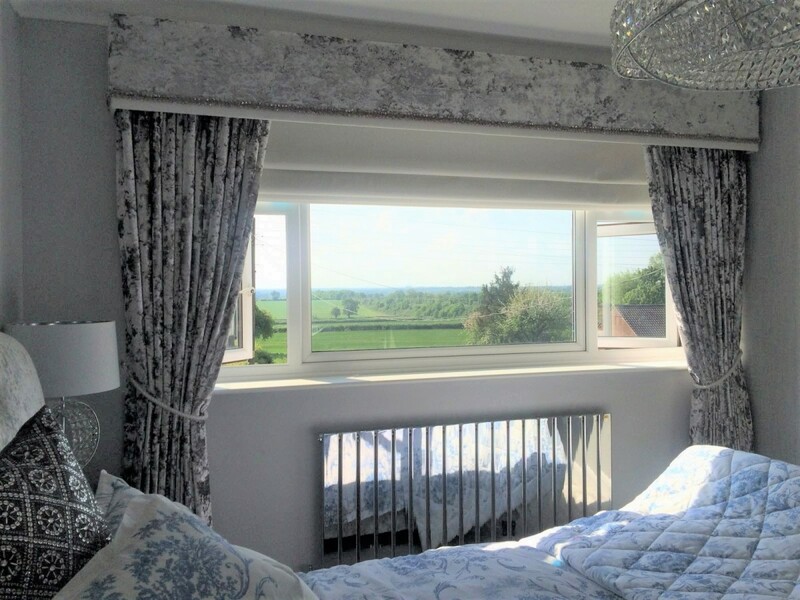 a black out blind and a pelmet, but was thinking of some sort of soft fabric to dress the window on one side but would obviously welcome some of your ideas too!" I will update you on the new room once it’s finished but in the meantime thought you might be interested in seeing why Teigan wanted me to return! On visiting Teigan’s beautiful home she took me to her newly decorated bedroom to view her handiwork and the first thing I noticed was the gorgeous head board. 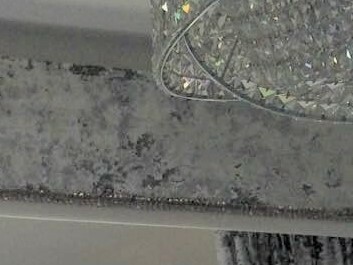 We discussed her ideas and I mentioned that I had a fabric that matched the headboard material exactly and we could compliment the luxurious fabric with delicate cluster beading which would also compliment the side lamp and central shade. Further editions of a padded MDF pelmet, contrasting trim, matching blind and glass tie backs finished the look. We think the finished look comes together beautifully with the amazing radiator and deep lush carpet.